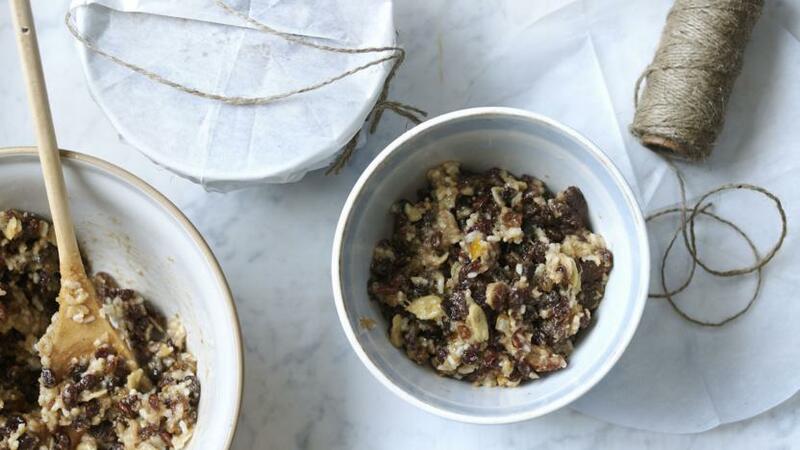 Make this easy Christmas pudding on Stir-up Sunday. Keep feeding it with brandy regularly to allow the flavours to develop. Lightly grease 4x600ml/1 pint or 2x1.2 litre/2 pint pudding basins. Stir in the eggs and brandy and mix well. Spoon the mix into basins. Put a circle of baking parchment and foil over the top of each basin and tie securely with string. Make a string handle from one side of the basin to the other so it is easier to pick the basin out of the pan after cooking. Put the basins in a large steamer of boiling water and cover with a lid. Boil for 5-6 hours, topping the boiling water up from time to time, if necessary. If you do not have a steamer, put the basins in a large pan on inverted saucers on the base. Pour in boiling water to come a third of the way up the sides of the pudding bowls. Cover and steam as before. Cool. Change the baking parchment and foil covers for fresh ones and tie up as before. Store in a cool cupboard until Christmas Day. To serve, steam for 2 hours and serve with brandy butter, rum sauce, cream or homemade custard. If you are making this as a dairy-free recipe, take care to ensure the breadcrumbs are dairy free. Although many breads contain dairy, free-from options are widely available - just check the label.